The car is one of those things we couldn’t possibly live without. Sure, you could take away our smartphones and our tablets, we’d complain but we would still be able to carry on with our lives. Take away our cars, however, and then there would be trouble.Our cars do everything nowadays, you can make phone calls, compose text messages and some cars have their own wifi hotspots, and it won’t be before long that our cars drive us to our destinations. So, when did it all start? 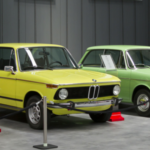 In this article, we look at the evolution of the car, from the first ever car to what’s next in the world of Automotive technology.